"It happened really fast," one fisherman told the Toledo Blade. 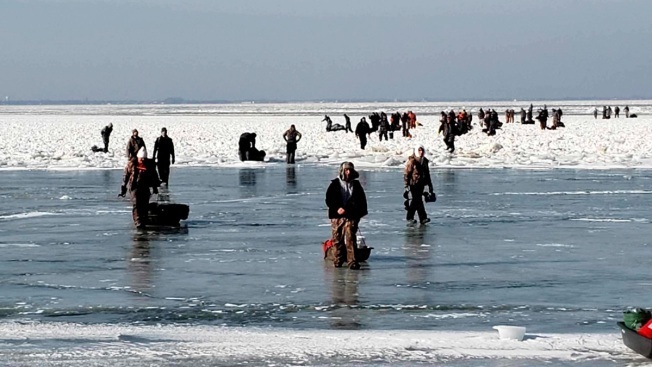 "Thank God the Coast Guard was here for us"
The Coast Guard and other agencies on Saturday rescued 46 ice fishermen who were on an ice floe that broke off on the Ohio shore of Lake Erie, the Coast Guard said. There were more people on the ice floe, but around 100 were able to swim or walk across ice bridges that had been connected to the floe, according to the maritime law enforcement and rescue agency. The Coast Guard was notified about the situation at around 8 on Saturday morning, and everyone was rescued by about 11 a.m., the Coast Guard said. "We're happy to report everyone is safe."